London Underground drivers make more than junior hospital doctors -- but they have just gone on strike for the second time in a month. The city's "tube" services were halted late Wednesday, causing delays and frustration for many of the network's four million commuters. The shutdown is part of a dispute over plans to introduce some overnight services at weekends. Drivers say the night shifts will mean unsocial hours and hurt their "work/life balance." They're also concerned about staffing levels and passenger safety, which they argue could be compromised as the new services will run during periods used for maintenance. Tube operators already enjoy generous pay and conditions, compared to other public sector workers. Drivers make double the average U.K. salary and have three weeks more vacation than most employees. London's transport system was crippled when the drivers stopped work on July 9. The Centre for Economics and Business Research estimated the disruption cost the city's economy about £10 million ($15.6 million). The frustration felt by commuters was compounded by the pay and perks drivers receive, which are out of reach for many workers. It takes as little as three months to secure an underground drivers license. Drivers typically work 36 hours a week, according to Transport for London, and earn £49,673 ($77,600). Holiday entitlements are generous, at 43 days per year. Benefits include free London travel for the employee and one other, and a possible £500 annual bonus. Related: What's the safest way to travel? It's a much tougher slog to become a doctor. First, they need excellent school grades. Then they have to pay for a five-year medical degree, which costs about £45,000 ($70,146) in the U.K. Years of additional training are required to specialize in a field like general practice or surgery. The tube driver training course? No charge. 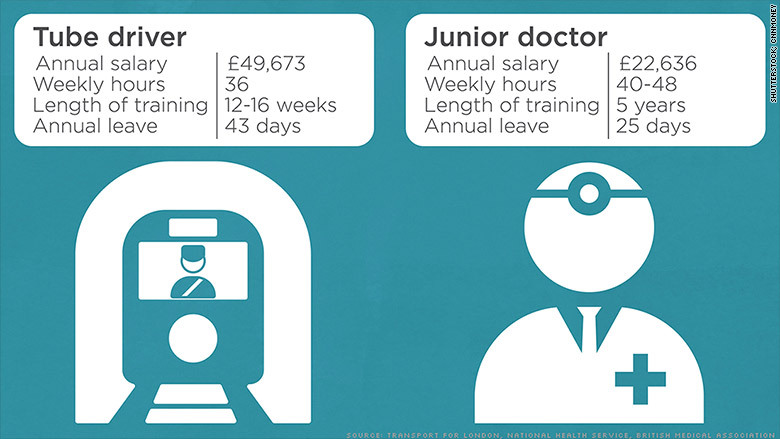 After five years of university study, a junior doctor in Britain will earn £22,636 ($35,400). After two years of training in hospital, that rises to at least £30,000. With weekend on-call shifts, these professionals regularly clock up twice as many hours a week as underground drivers. The British Medical Association said newbie doctors aren't entitled to bonuses or overtime, but may be compensated for unsocial hours in some circumstances. Annual leave entitlements of 25 days are roughly in line with the national average. The grueling start for doctors does have its payoffs. Earning potential is strong and senior hospital doctors in the National Health Service can make up to £100,000 ($156,000). Transport for London says a tube driver's salary doesn't alter with time spent in the role. Still, those who like the sound of driving a tube train will be disappointed: Right now, London Underground is not hiring. For the past four years, the tube has recruited about 200 new drivers each year from within the city's wider transport network. And there are no plans to hunt for drivers externally in the coming years.